Linus Carl Pauling is born on February 28 in Portland. He is named Linus after Belle’s father and Carl after Herman’s. A month after Linus is born, Belle takes him on a trip to her home in Condon, where she shows her father and sisters her new baby. Early in May, Belle and Linus return to Portland. On August 7, Pauline Darling Pauling is born in Portland. Herman continues to work at Skidmore Drug Company. President Theodore Roosevelt visits Portland in May, and both Herman and Belle enthusiastically support him and his causes. In the fall, Herman moves his family to Oswego, where they settle in a house on Second Street (their apartment room in Portland had become too small to comfortably contain the growing family). On January 1, Frances Lucile Pauling (called Lucile) is born. She is named after one of Belle’s favorite poems, Owen Meredith’s "Lucile." Linus, Pauline, and Lucile are baptized by an itinerant minister. In October, Herman moves his family to Salem, where he has found a job as a traveling salesman for D.J. Fry, a jeweler and druggist. His family settles in a little house at the corner of Saginaw and Mission Streets. 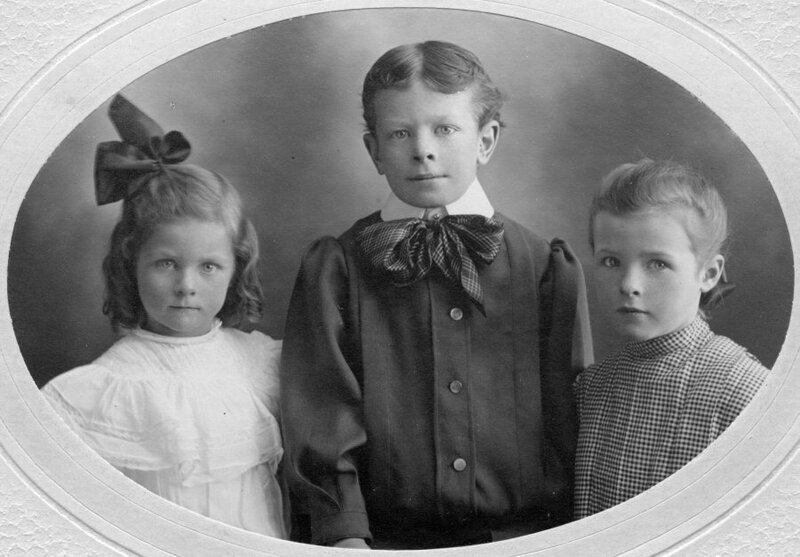 Linus, Lucile, Pauline and Herman Pauling, 1904. In November, on one of his typical trips, Herman travels up and down the Willamette Valley, visiting the towns of Dallas, Sheridan, McMinnville, Newberg, Beaverton, and Forest Grove. From the evidence of letters Herman sends to Belle while he is on the road, it is obvious that these trips (and his many hours away from his family) are becoming increasingly burdensome to him. In February, Belle hears of an improvement of business conditions in Condon, and in March, Herman goes to the Skidmore Drug Company in Portland to investigate his chances of setting up a drugstore in Condon. On March 14, Herman closes a deal for a store in Condon. 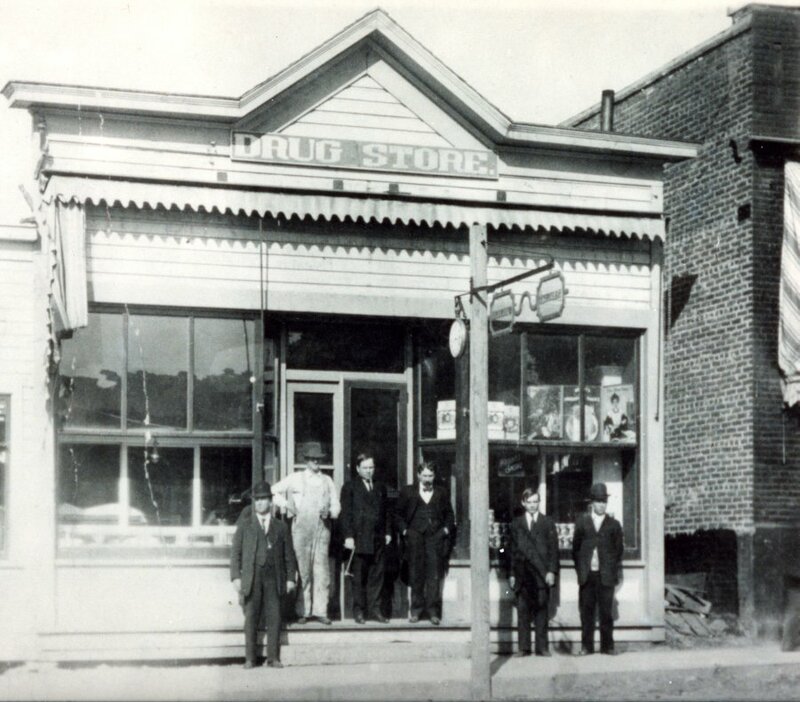 Herman Pauling's drugstore, Condon, Oregon, ca. 1905. In the third week of April, Belle and her children travel from Salem to Condon, where they arrive in time for Easter (April 23). Through June and July, the Paulings live above Herbert Stephenson’s general merchandise store (Herbert Stephenson had married Goldie Darling). Linus remembers pulling his wagon around in the yard behind this store (his earliest memory). In July, Belle returns to Oswego with her children to spend the summer with Herman’s parents. This is the summer during which the Lewis and Clark Exposition is celebrated in Portland (one hundred years before, William Clark and Meriwether Lewis became the first white men to visit the site of Portland). Belle takes her children to the exposition. Belle and the children arrive back in Condon around September 15, when they move into their new house, not far from Herman’s drugstore. In the spring, Linus awkwardly tries to say the word "mule" for a nearby animal, provoking guffaws of laughter from some cowboys. It is the first indication of his lifelong interest in the precision of language. In the summer, Belle again brings the children from Condon, which is unbearably hot, to the relative comfort of Oswego. From Herman’s letters to his "Dear Rose and Rosebuds," it is clear that he is becoming disillusioned about Condon and his drugstore. In September, Linus, back in Condon, enters the two-room school on the north side of town. During the summer, Belle and the children vacation in Oswego. Business is bad all over the United States, and the Paulings experience severe financial problems. In the fall, bank runs and financial panic occur throughout the country. To improve his business, Herman expands his operation into jewelry and takes on a jeweler as his partner. In September, Linus enters the second grade. He especially enjoys arithmetic and spelling. In September, Linus enters the third grade in the large, two-story grammar school located on a hill on the east side of town. 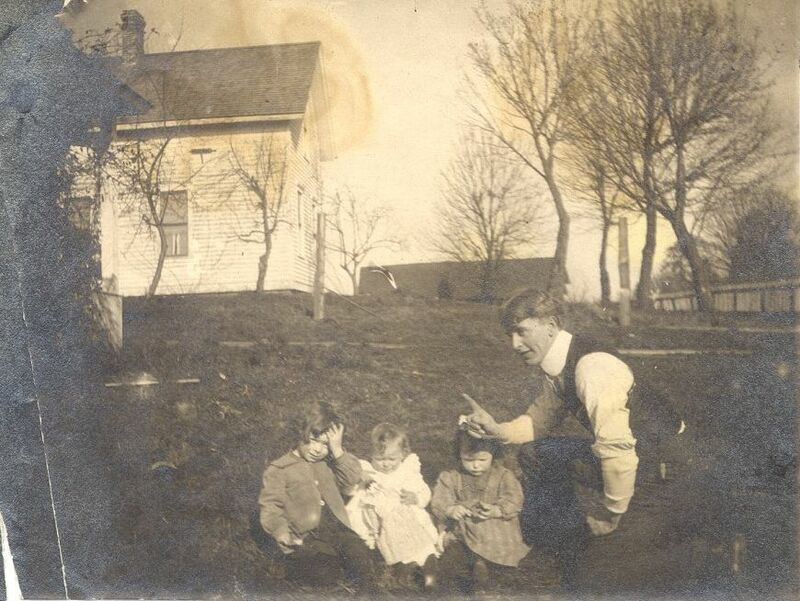 Pauline, Linus and Lucile Pauling, 1908. In the summer, Belle and the children spend their customary vacation in Oswego. In September, Linus begins his fourth grade in Condon. Herman’s drugstore catches fire, causing much damage (even more damage results when firemen break through the large plate glass display window and trample the cut glass objects exhibited for sale). Late in the fall, Herman moves his family to Portland. Linus begins attending the Clay School, on the west side of Portland, until his father’s new drugstore is opened. While Herman is setting up his new drugstore in East Portland and finding a home for his family, he works for a few months at Skidmore Drug Company. Linus attends Glencoe School after his father opens his new drugstore. The Paulings move to East Portland, where Herman begins work in his new drugstore. Both the store and their new home are on 45th Street. In the fall, Linus, Pauline, and Lucile start attending Sunnyside Grammar School. Book annotation by Linus Pauling, ca. 1909. 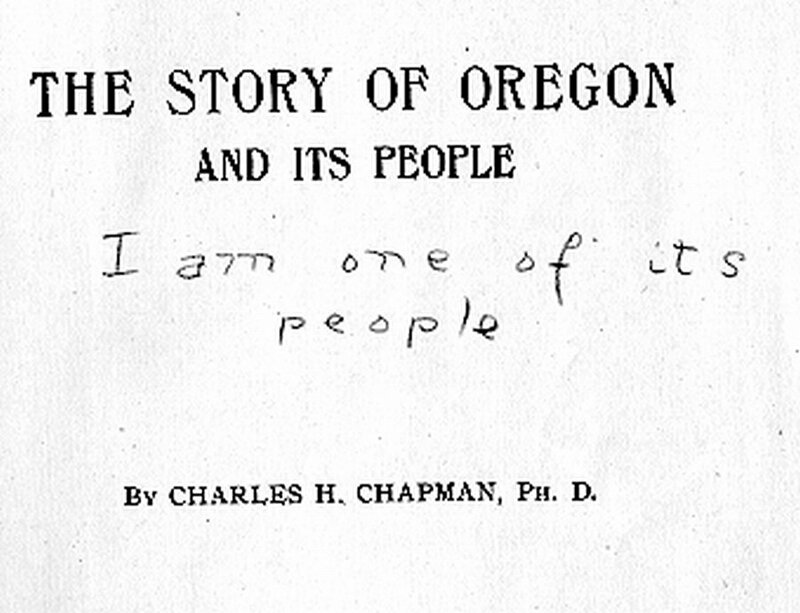 On May 12, Herman Pauling writes a letter to the Portland Oregonian about his nine-year-old son who is "a great reader" and deeply interested in ancient history and the natural sciences. He asks readers of the newspaper to advise him about the proper works to procure for his child who has "prematurely developed inclinations." On April 12, Linus Wilson Darling dies in Sellwood, a suburb of Portland. The primary cause of death is "valvular disease of the heart," with a contributory cause being "acute nephritis." On June 11, Herman Pauling suddenly dies of a perforated stomach ulcer with attendant peritonitis.